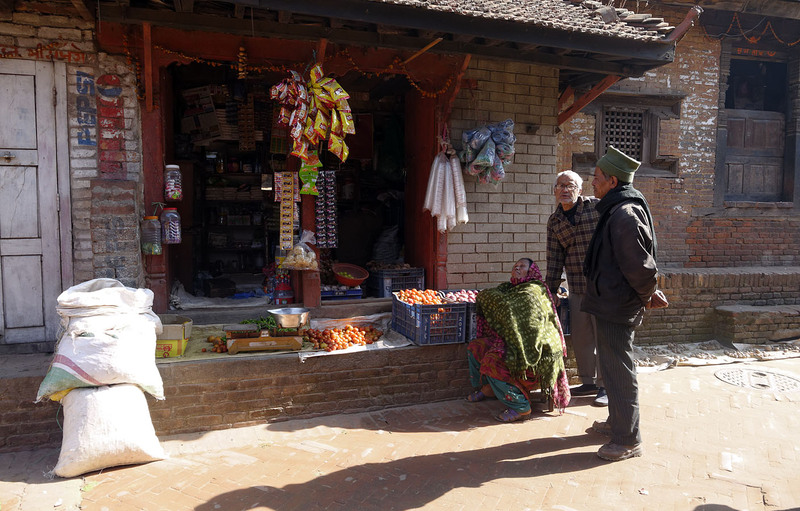 As with countless villages in Nepal, life in the Newar village of Jhaukhel had changed little for centuries until Nepal opened its borders in 1951. 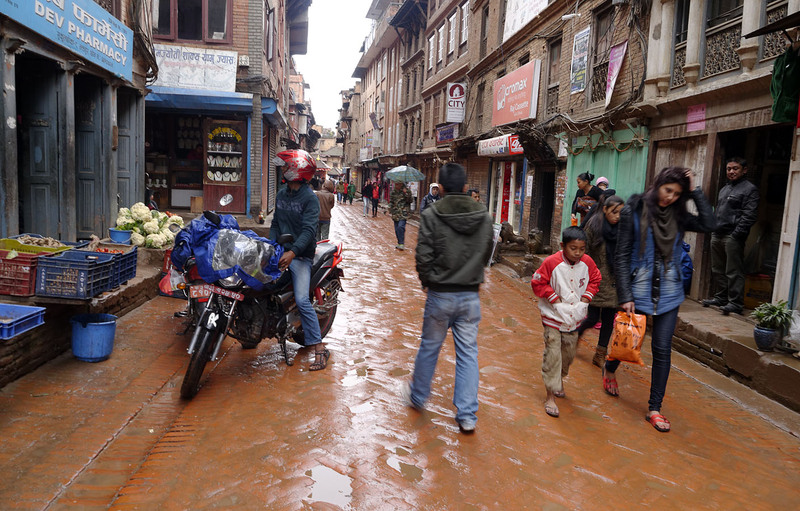 Village culture remains strong today, but foreign influences, such as the motorcycle the older girl is leaning against, have already damaged the culture and may eventually destroy it. Striking a balance between tradition and modern conveniences is a challenge for most of the world, but nowhere more than in Nepal. Click on any photograph to open a bigger version in a new tab. Ctrl+w will close the new tab and return you to your Carfree Times tab. 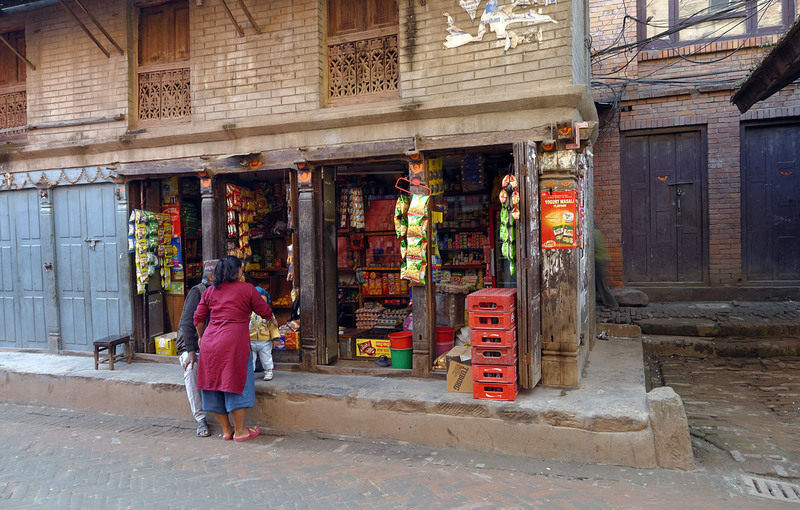 The backbone of commerce in Bhaktapur is still small shops owned and operated by a family. 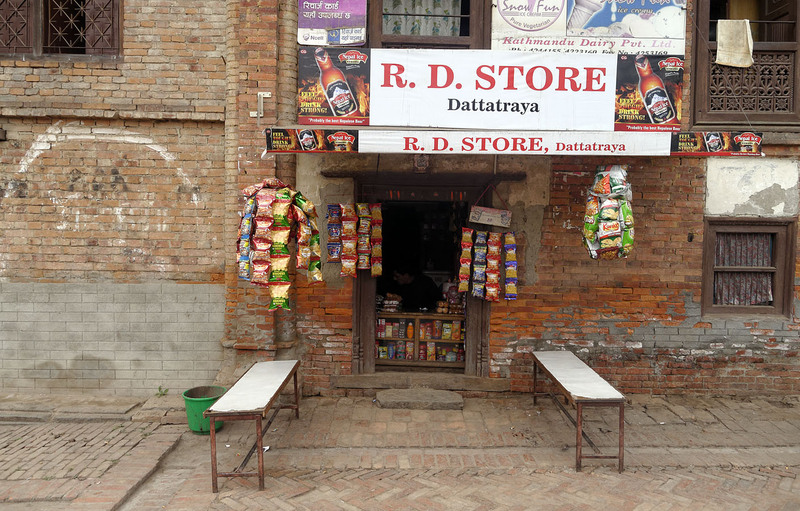 Larger shops are starting to creep in, and the first big-box stores have already made their appearance in Kathmandu, where small shopkeepers are already under threat from larger operations. This is a worrisome trend, given the importance of small, locally-owned shops to the neighborhood social fabric. Bhaktapur is not yet greatly affected by this change, but already larger shops are appearing down on the highway. 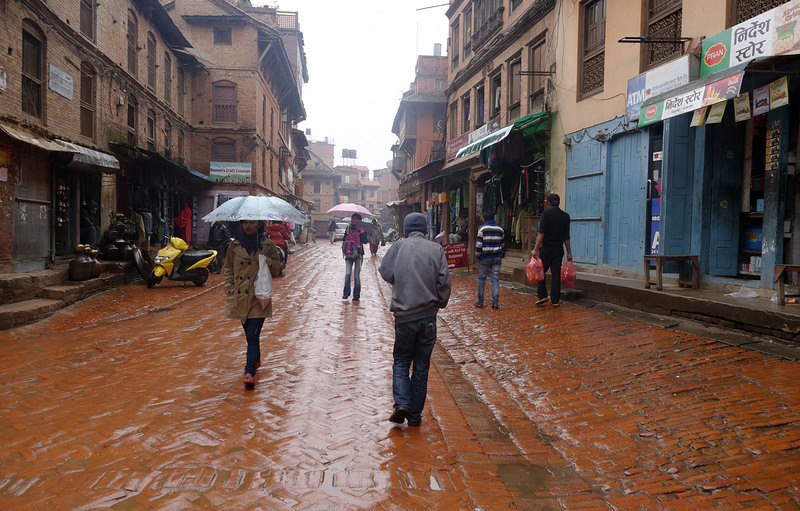 The midlands of Nepal have highly seasonal rainfall, with very little occurring between October and February. This was one of the first rains of the new season. Heavy rain falls during the monsoon, roughly June through September. Carfree.com, in cooperation with Work for a Better Bangladesh, is hard at work on a one-hour video that considers the many challenges to sustainability that we face and offers a full set of solutions. We aim to have the film released in plenty of time to influence the Paris climate talks in December. The film will be released under a Creative Commons attribution-only license, and groups around the world are invited to make a localized version in their own language. We will be able to furnish all the materials that went into making the initial version, which will be released first in English, followed quickly by Nepali and Bengali. We are excited about project, by far the most ambitions film we have undertaken. You can also use the new Carfree channel at Vimeo. If you watch a video, please Like it by clicking the Heart icon in the top-right of the video frame (Vimeo) or clicking the Thumbs Up icon below the video (YouTube). Posting to Twitter and Facebook will also help. We need to get the message out to a broader audience and develop our audience for the coming film. The Carfree page on Facebook has been online for about two years. We post two or three times on a typical day. The CarfreeCities feed at Twitter has similar content to the Facebook page, but some of you may prefer the Twitter format. We have also pinned some nice images on the Carfree feed at Pinterest. Don't forget to Like us! With the rapid growth of urbanization and industrialization worldwide, the issue of sustainability has come to the forefront of global concerns. As people come to understand the catastrophe that global climate change presents as well as the consequences to local environments and health, they are demanding a reduction in carbon emission and a change to sustainable cities and nations. The quality of life in a city is largely determined by the existence of strong communities and high-quality public spaces. In most new-built urban places, a sense of community value and public presence is lacking. In fact, for Nepal, city life is characterized by individualistic lives and a lack of community when compared to village and rural life. 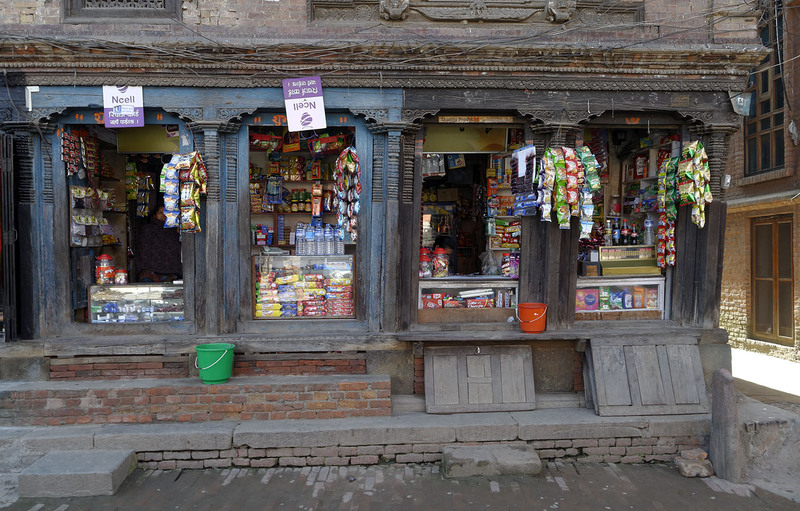 By this measure, the historic Newari settlements of Nepal are characterized by excellent urban design. The Newars placed great value on public spaces and the exterior appearance of the buildings, particularly the elaborately carved windows and doors. 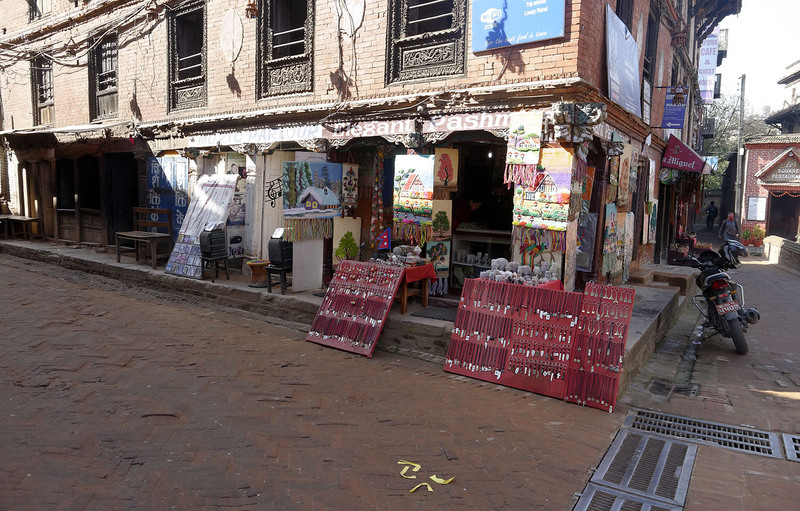 Most Newar cities and towns enjoy a high standard of art, sculpture, architecture, and town planning and design. 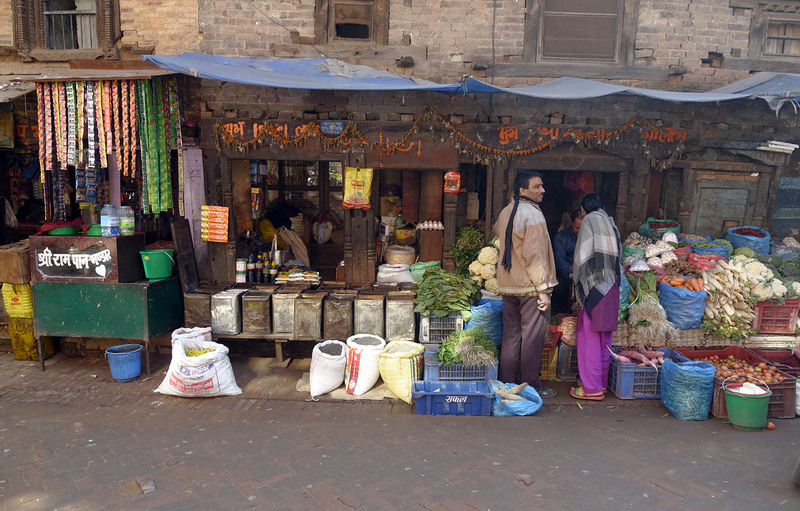 In this article, we will discuss the distinctive urbanism of the Newari people and their settlements and then compare it with global urban trends. In particular, the increasing sustainability issues with cities in the developing world need solutions, and we will consider the advantages of traditional Newari urbanism with respect to strong societies and long-term sustainability. We will also consider the need for solutions that meet local needs. 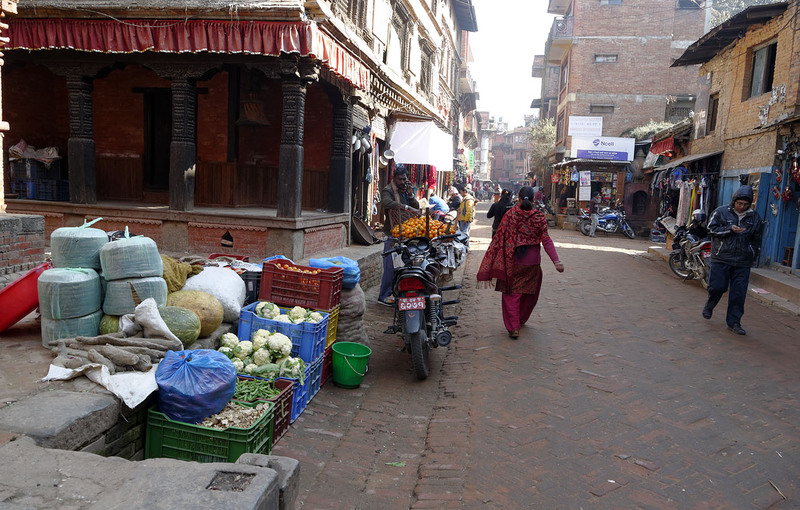 In Building Today in Historical Context: Bhaktapur, Giovani Scheilber states that "Newari town planning with all its many typical features, must be described as the single, great, cultural achievement of the Newari people." He further states that the careful design of furnishings in public spaces shows the importance laid by the planners on public life. 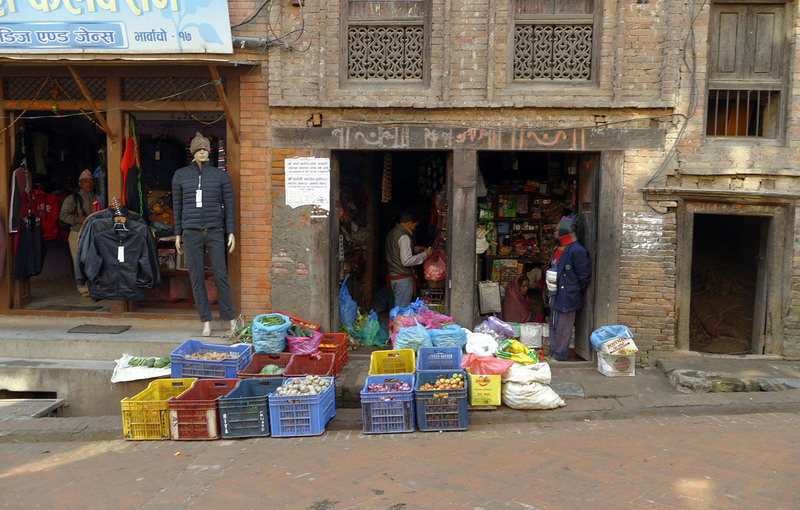 He notes that settlements of other ethnic groups in Nepal exhibit a dispersed pattern of agglomerations or main-street villages, while Newari settlements are all compact and dense. Another aspect of the Malla period (12-19th century CE) was the emergence of a society principally organized by occupation, in which families that are engaged in the same occupation lived in small sub-communities. This became a strong social force that influenced the overall planning of the city and helped to minimize the distances people travelled every day. 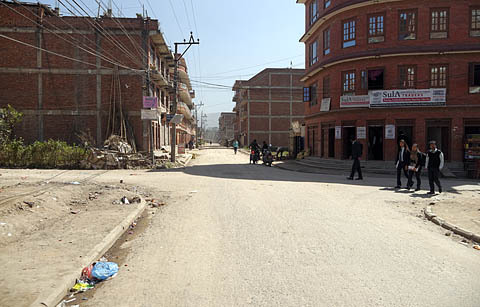 Newari town settlements show highly sophisticated town planning. 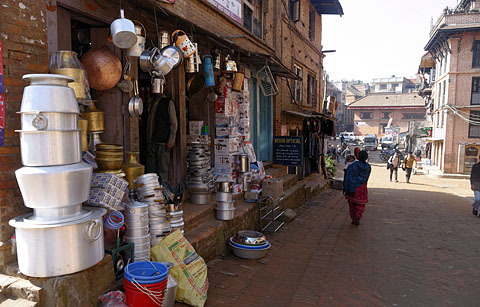 Even the smallest Newari settlements exhibit the same basic urban characteristics: compact settlement, high building density, a wide variety of occupations, and high quality of life. The urban characteristics included high population density and small land area occupancy, so it becomes apparent that the Newari people long ago understood the value of land and the need to conserve it. The compact pattern of housing freed up some land for public space in every neighborhood. Instead of building large houses, they saved land to establish courtyards for each neighborhood group of houses. Public space arrangement was given high priority, and street-facing building façades featured wood carvings and elaborately cast bricks. The public spaces included market squares, neighborhood squares, residential squares, and a Durbar (royal) square in each section of town. They also constructed water reservoirs (pokhari) and conduits in each neighborhood in order to supply water for agriculture and household use. Drainage systems were also constructed. 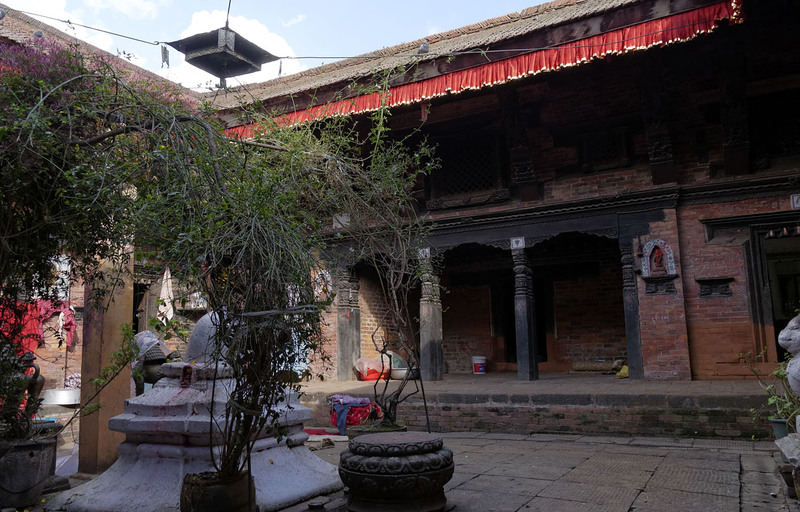 The urban society of Kathmandu Valley emerged over the course of many centuries, and no one historical figure had more than a small influence on the result we see today. The Newar urban form began to emerge during the Kirata epoch (800-300 BCE) and continued through the Lichchhavi period (approximately 400 to 750 CE) right to the end of the Malla period. The most notable planning idea applied in traditional Newar towns might best be termed "zoning by jaat," (a caste that was based on a profession), which at once ensured survival of the profession, reduced intratown movement (because of home-based work places), and allowed the growth of localized, homogeneous communities. 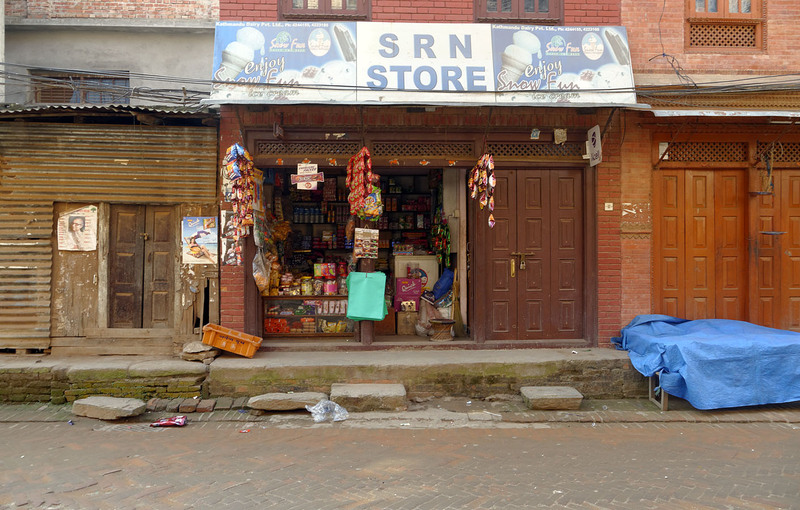 According to Sudarshan Raj Tiwari, the dispersal of "jaats" in the town was based on "proximity priority related to the frequency of consultation" with the palace or the state. The neighborhoods established by professional division also embraced the work-at-home principle. Physical boundaries between the jaats were not necessary as relations between castes were normally harmonious. Each sociocultural group had its own "guthi," a community organization that placed various responsibilities and duties on each caste group for arranging rituals and festivals, a time when caste divisions were dissolved, thus ensuring that heterogeneity prevailed in the larger society. The Guthi appears to have a strong role and may have been one of the reasons underlying the form and function of public open spaces. The "Guthi system" was a trust, in which land was donated to the trust and any revenue generated helped the community at large and was utilized for various community works such as restoration of temples, patis (rest houses), maths (priest houses), dhunge dharas (stone water spouts), and to carry out various festivals, customs, rites, and rituals. 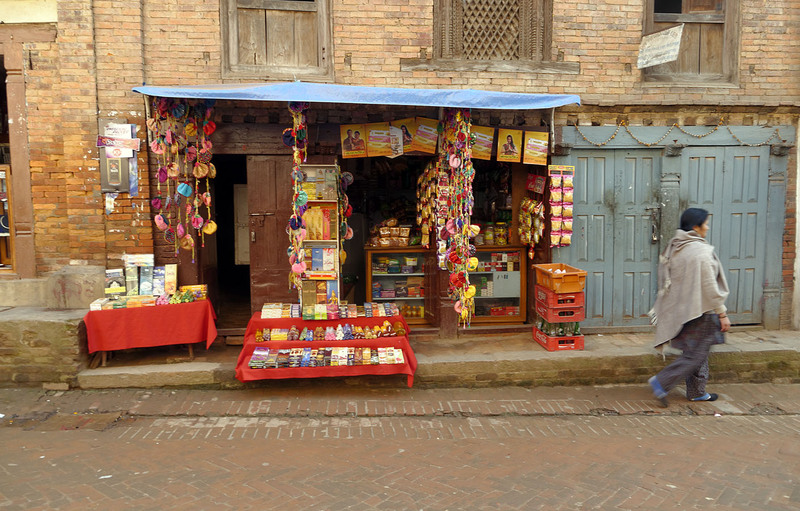 Strong socio-religious imperatives helped to protect the donated lands from misuse. According to Mangala Devi Singh in her book Nepali Sanskriti ka chhata haru, most of the Guthi system is slowly being lost due to changes in the social structure of communities and even more so as a result of changes in the past 50 years, including the nationalization and institutionalization of the Guthi system and land reform campaigns. 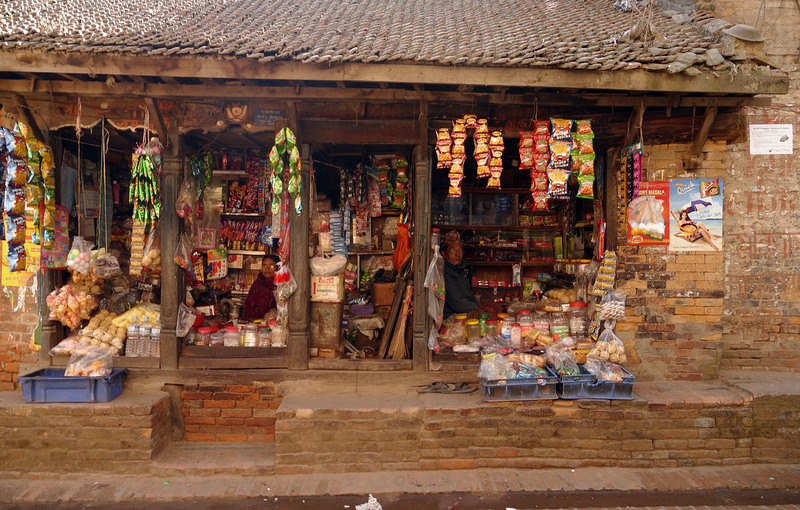 Most Guthis do still exist although the activities that they conduct have in many cases diminished considerably. Newars developed sophisticated irrigation techniques for the highly fertile land they occupied. Their agriculture was so productive that they harvested two or three times a year. 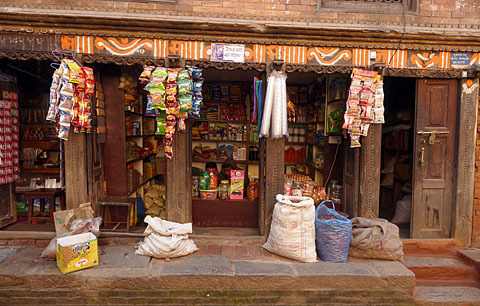 The resultant food surplus enabled them to begin trading with neighboring settlements for goods. They had plenty of time for their other occupations, such as art, stone sculpture, and wood carving, which later became the basis for dividing the society by occupation. Financed by the Guthi system, the surplus time was also invested in a group of people such as masons, shilpakars (the group of people who work with wood) and helping them to develop their skill. They spent most of their leisure time making their town more beautiful, and this led to the creation of vibrant societies. The many festivals and rituals scatted throughout the year made their towns lively all year long. Through the course of centuries, a rich tradition emerged that underlay their art and culture. 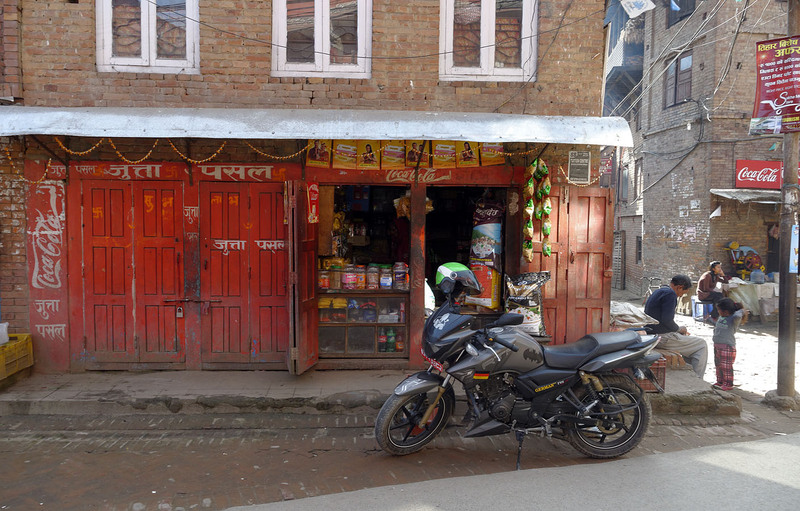 Sudarshan Raj Tiwari, in "City Space and Life then, 150 years ago - A presentation of concept and realities" (PDF), explained the design of Newari settlements and their characteristics as being based on pedestrian scale. 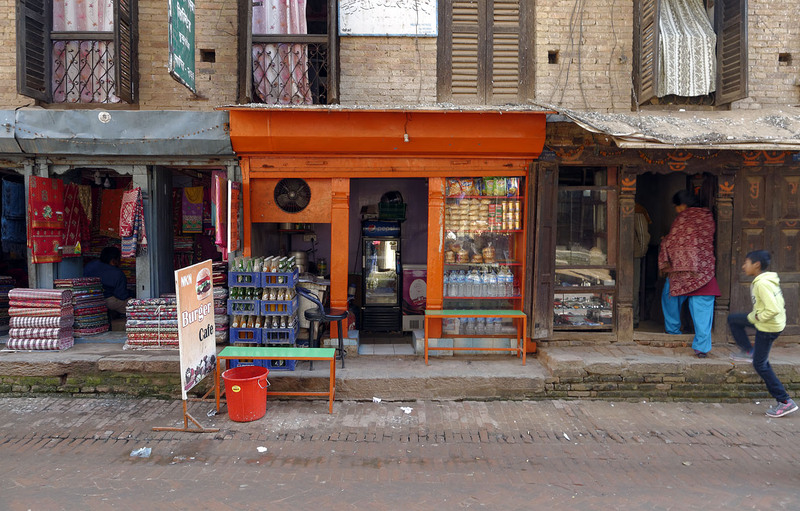 He further explained that streets were built as activity spaces and that different forms of community spaces were distributed throughout the town. These arrangements tended to make the town more responsive to the needs of communities than of individuals. Tiwari further explained that Newari towns were not only built to human scale but were also designed for pedestrians. The buildings and their ornamentation were designed with the pace of pedestrian movement in mind. The plain-surfaced buildings, embellished with minutely detailed windows, were a response to the human ability to savor details when moving slowly. Unlike today's monotonous grid-based cities, the width of the streets varied in response to the design features of buildings, which resulted in much variation. 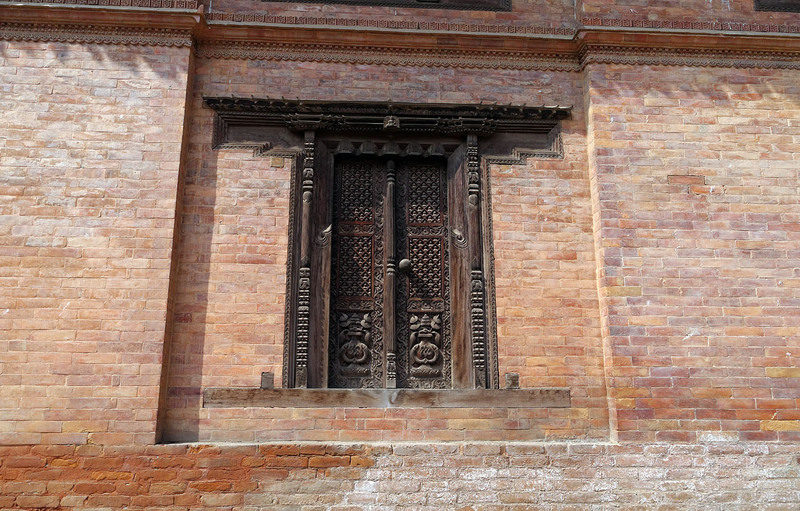 Thus, streets became more than just streets, and a hand-carved window became much more than simply artistic self-expression. 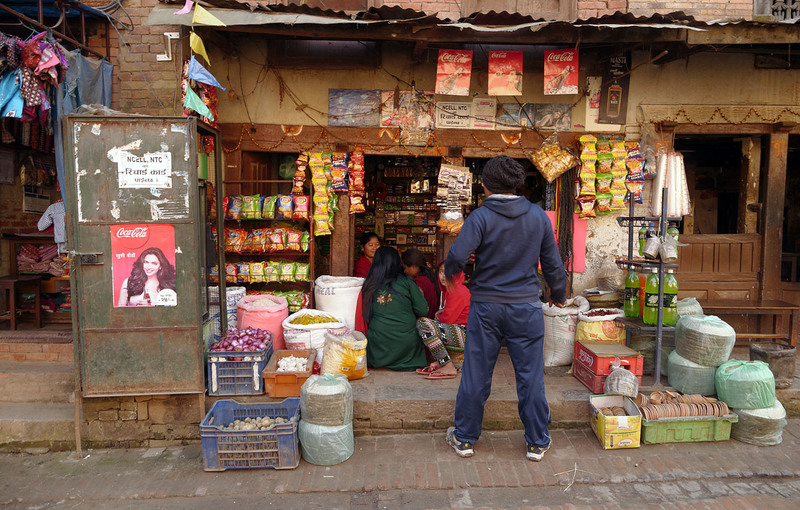 Tiwari also mentions that spaces were traditionally divided into three types: nodal spaces, street spaces created by varying widths, and Bahal spaces. The Bahals were the religious spaces but gradually transitioned to workshops. Durbar Squares were specifically for kings, and had cosmic images in them, but gradually transformed into space for ordinary people. 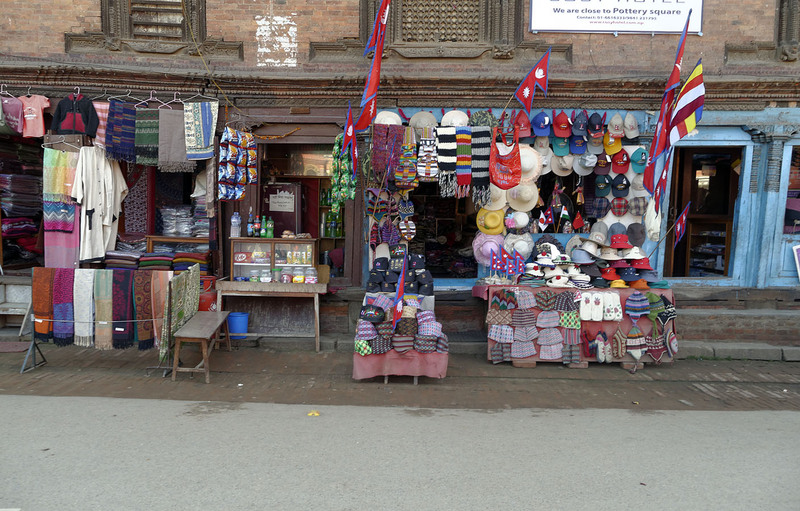 In recent centuries, the Durbar Squares have become market squares, which would once have been unthinkable. Nodal spaces were characterized by informality and an element of surprise. Unexpectedly large or small temples would spring up from behind to make one look up the sky or down at a deep stone water conduit. The central royal squares became the seat of power and the place where royals and nobles mixed. 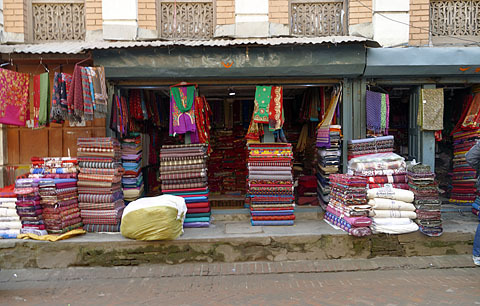 The medium-sized squares are used as markets and social centers. The street network is hierarchical. Besides the main streets, narrower side-streets ("gallis") led to the market or social squares belonging to different jaats. These social squares were semi-private spaces used mainly by extended family groups. 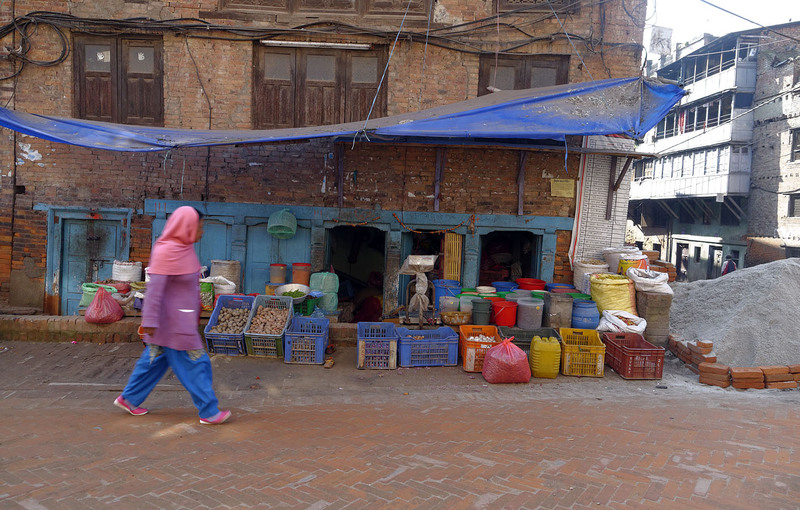 Streets were more than just movement spaces for pedestrians. Their irregularity was deliberate and intended to enhance their use as activity spaces. 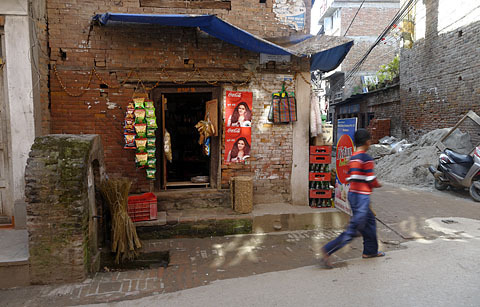 The streets were linked to the interior of houses not only by the building design elements of the "Dalan." 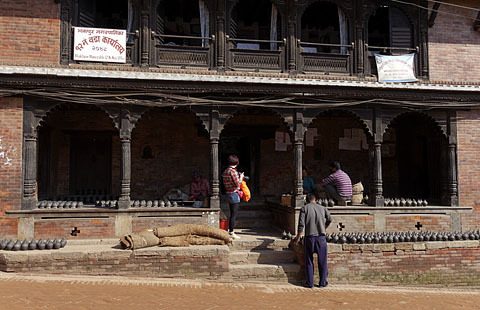 A Dalan is the covered open space behind twin rows of carved and ornate wooden columns. Enclosed space around the Dalan is used as entrance with staircase and storage space or shop front; a private residence is located above. 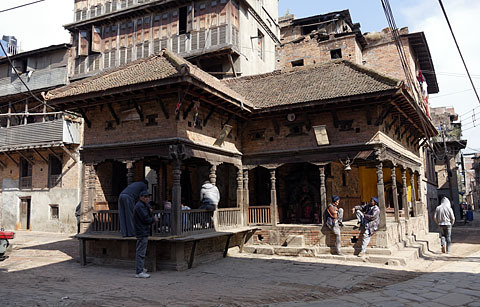 The Dalan is internationally recognized by architects as a distinctive element of Newari architecture and one that gives priority to public spaces over private space. 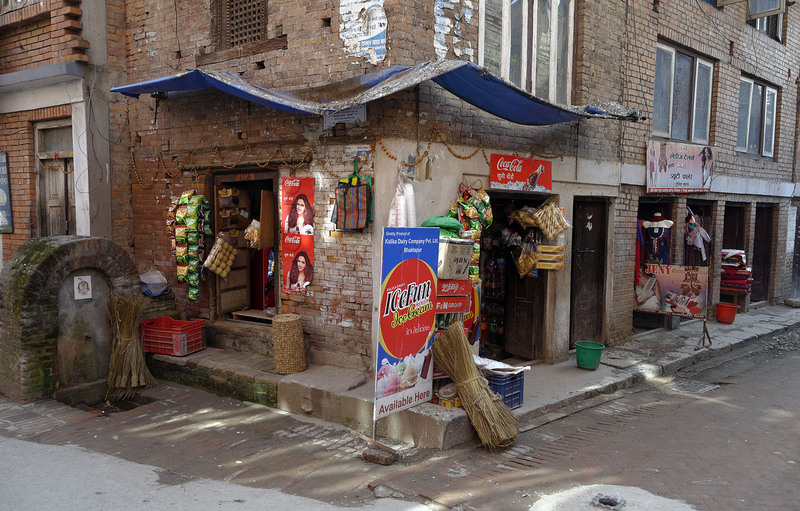 Sometimes the entrance leads to the Chowk (courtyard) that is surrounded by a Dalan which provides access to several different houses. House and street were clearly intended to interact visually as well as physically. The streets were used for open shops, gossip places, meeting locations, places for household work, and locations for rituals. Often, the streets were used for several functions at once, as in the case of gossiping while knitting. The streets were also used for daily movement to the farms. Commercial function tended to be concentrated on the main streets and at intersections. Squares were formed where a number of streets intersected to create a single node with a specific function. Their spatial configuration differed depending on the social and economic aspects of their use. The principal types of squares were: markets squares, religious squares, Durbar (palace) squares, and residential squares. The major squares were located near the center of the town and acted as civic centers because many activities occurred there that were of interest to a large portion of the town's population. Historically, these squares were known as the centers of specific communities. Today they help to shape the identity of the whole city. 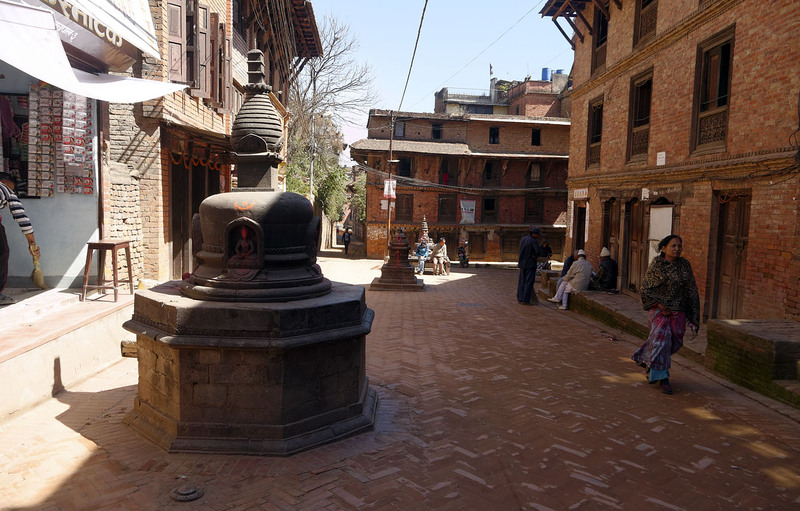 Every square had religious shrines, community buildings, and rest houses. Newar town planning concepts were based largely on preservation of nature and resource conservation. That is why, with the few exceptions, the settlements were established on the highest ground, with arable land at lower elevations. They were generally situated well above the river thus safe from flooding. They had traditional methods of waste management, with each community having its own organic waste bins, which eventually produced compost that was spread on the fields. 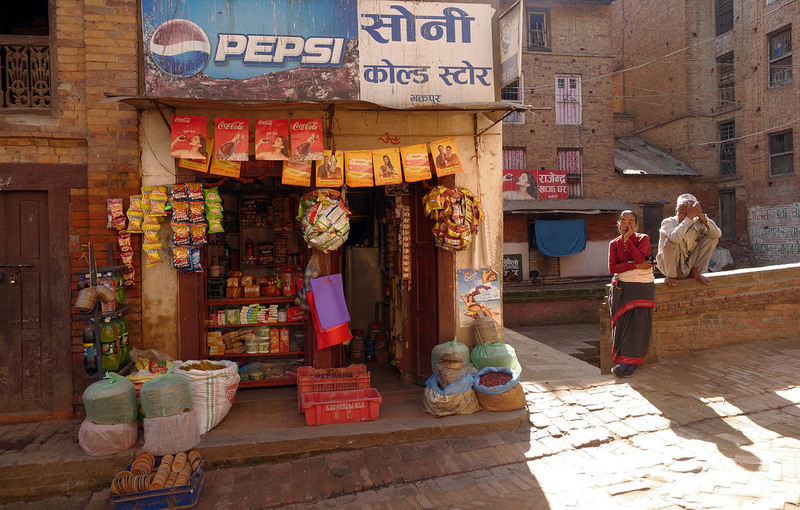 Only after the 1482 Malla kingdom's division into the three roughly equal-sized kingdoms of Kathmandu, Patan, and Bhadgaon, did the towns have to be surrounded by walls or moats. The boundaries were defined by boundary gods, such as Matrikas. The establishment of occupation-based jaats soon became a strong social factor in affecting the overall planning of the city. Over the last few decades, changes have been so extensive that in many places it has become difficult to visualize what the past would have looked like. Roads have been widened and extended, and motor vehicles have always been given precedence. Pedestrians have been relegated to whatever small space may be left over. The concept of the city-state that developed in the late Malla period (around 1480) has come and gone. In its place is a centralized government. However, for many years the air was still clean, and the presence of nature formed a beautiful backdrop to the urban scene. 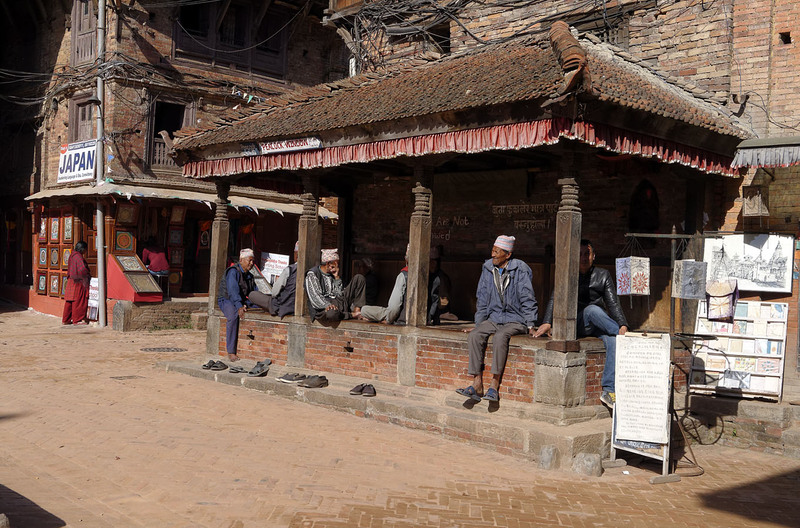 Life was leisurely, and the town was well adapted to this slow-paced life. 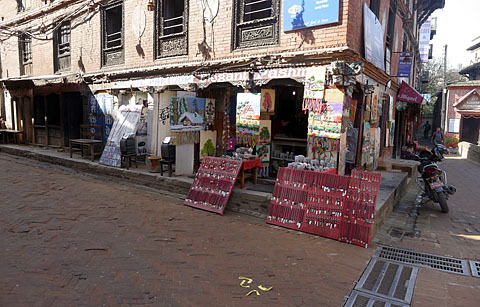 Until recently, people could go for a family outing in a nearby peaceful square and feel quite at ease. Scheilber states that after the Malla rule was brought to an end by the Gorkha invasion of the Kathmandu Valley, some years of political and economic inactivity began for the Newari people. 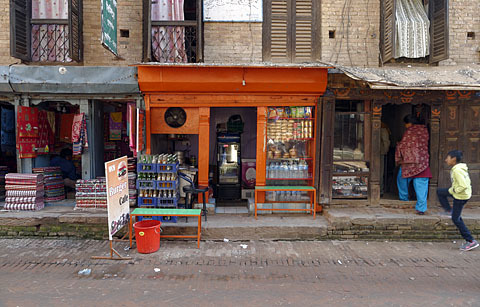 This occurred because crucial parts of the urban structure were neglected. 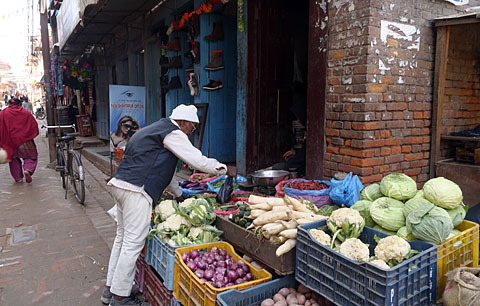 Newaris lost a substantial part of their arable land when land ownership was reorganized. A tax system was introduced from the profits to invest in the imports of goods by the Royals and the noble class. As a result, the per-capita income of the people suffered a large and permanent reduction. During the worst part of this period, the extravagant household budgets of the Rana families impovrished the region. 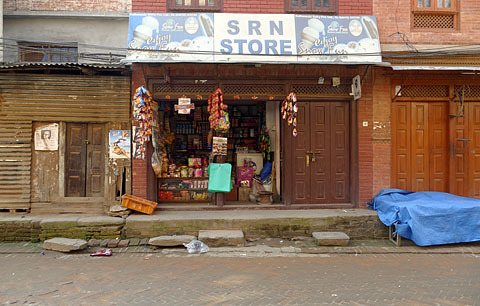 With the ending of Rana rule came a huge change in events affecting the Newar cities and towns in the Kathmandu Valley. The Ranas had been influenced by Western ideas of development. Those with money built large villas in the European manner to show their difference from other people and to demonstrate their refusal to integrate with the Newaris. The re-opening of the trade route from India over Sikkim to Tibet resulted in a large reduction in the per capita income of the Valley's population. 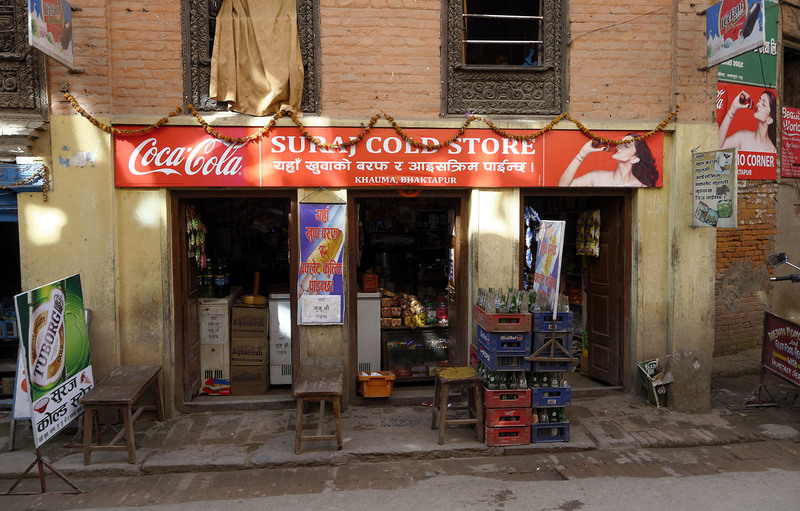 It is uncertain, but it may have been that trade routes from India to Tibet via Sikkim undermined what had once been a monopoly trade route through Nepal. After the Chinese conquest of Tibet in 1950, the borders between Nepal and China were completely closed for decades, which ended the centuries-old trade that had maintained elements of Nepali society. In many places, small holdings were impoverished and the urban character degraded. 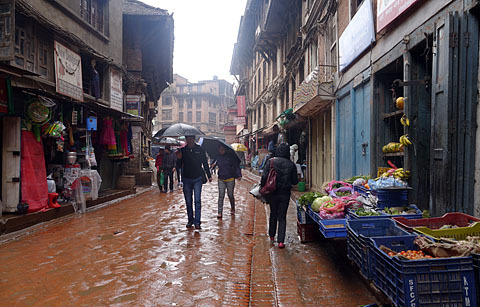 Following the end of Rana rule, there was a mass migration out of over-populated old city centers and immigration from all over Nepal into the Kathmandu Valley. 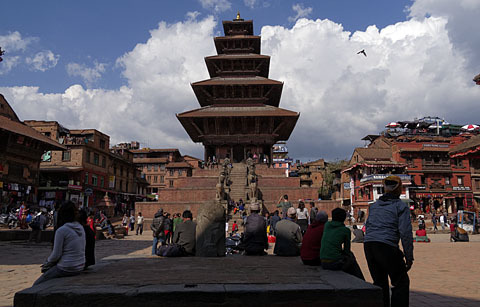 Kathmandu, Nepal's capital and principal city, was seen as the place that offered the greater opportunity and also enjoyed the most highly developed infrastructure. The migrations of the last 40 years led to the break up of the extended-family structure of Newari towns. Agricultural land was lost to buildings which made inefficient use of the land. These changes caused a massive shift in the political landscape of Kathmandu. The disintegration of cities and towns has led to the adoption of the Western philosophy of development, with modern concrete skyscrapers and wide roads. 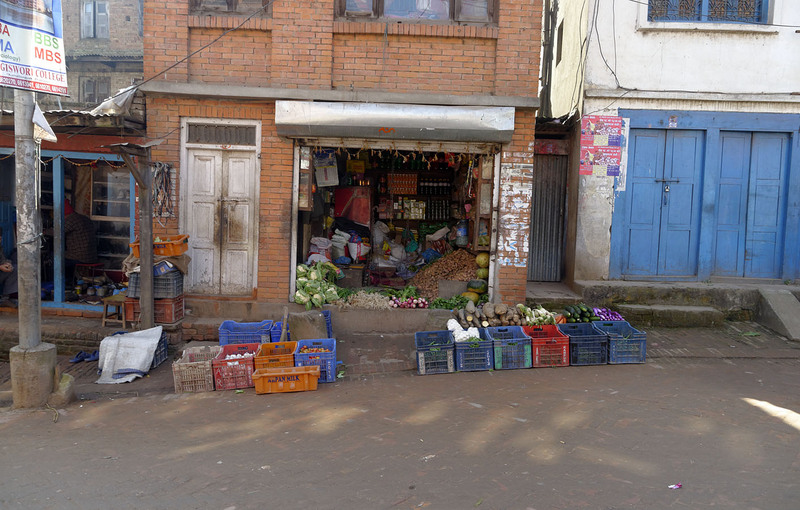 This has been accompanied by a neglect of urban social spaces and the dedication of public land to private transport. 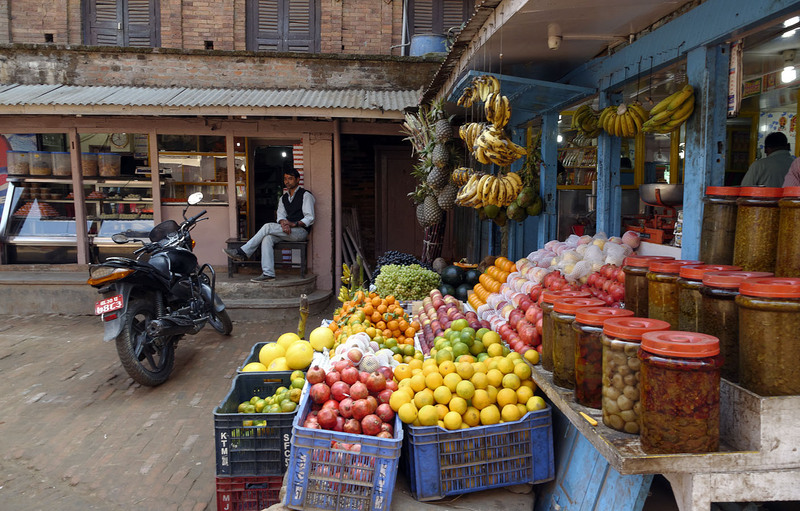 With the rise of globalization came a rapid increase in mass production and consumption along with a massive migration of people from other regions of Nepal to the Kathmandu Valley. This in turn led to the rise of unemployment and slum districts near the river valleys. The rapidly-emerging cities are becoming unmanageable in the matters of traffic management, waste management, and sewage disposal. 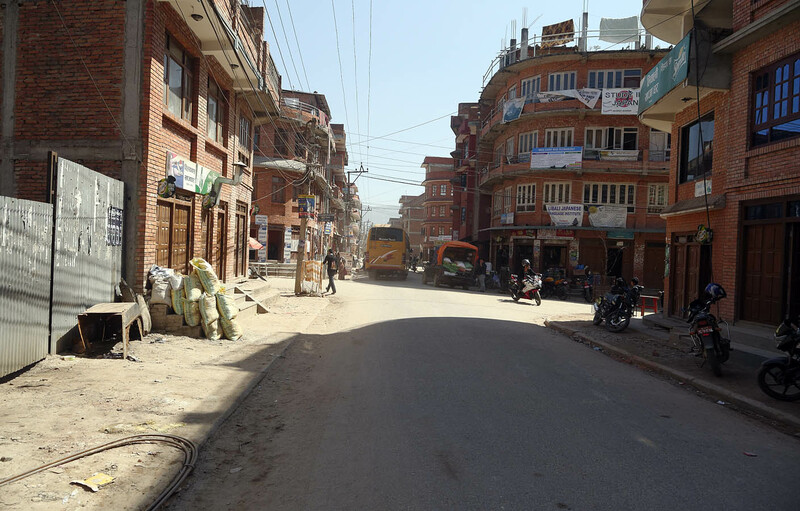 Without the careful planning that once characterized the Newari cities, urban Kathmandu is destroying land and natural resources. This has already led to an environmental crisis and may lead to a severe scarcity of essentials in the future. 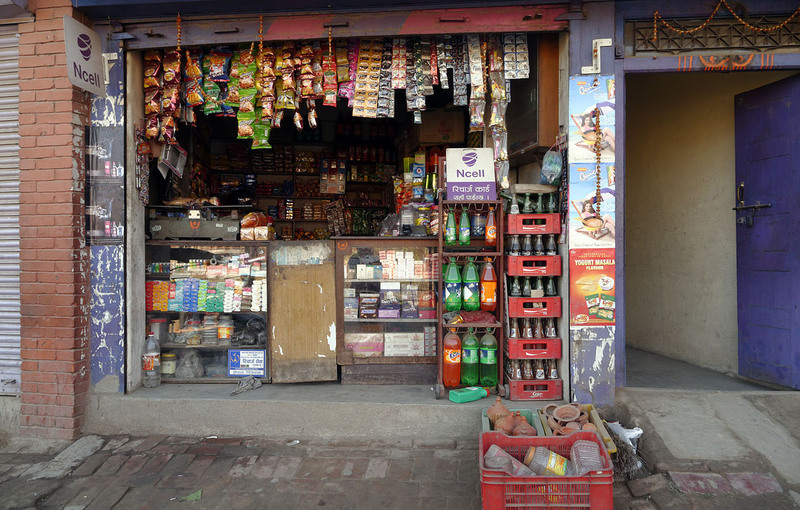 In his graduate thesis "Integration of Urban Edge and Cultural Heritage Zone," Shyam Sundar Kawan mentions that modern societies now limit the opportunities for sociocultural ambiance, ecological society, and communal activities that once prevailed in urban spaces. In the present context of development, cities are better known for their explosive growth than for their culture. Developing countries as a group tend to put greater priority on their economic development than on the preservation of their heritage. 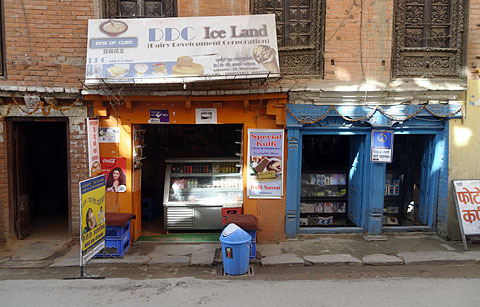 The commercial and business city is so dominated by economic considerations that the town has become a conglomeration of enterprises. Today we tend to forget that the original reason for networking was to create a forum for living. This has now deteriorate into sociocultural inter-dependencies that exist in a heterogeneous environment with diminished cultural expression. 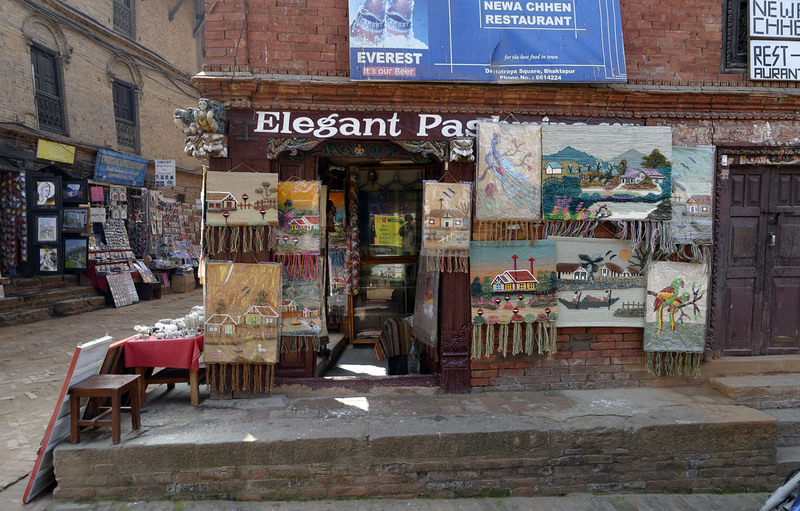 As foreign tourism has increased, cultural, social, and symbolic resources are expended in the name of economic benefit which comes at a cost to traditional culture. Modern development has created boundaries in the form of fast roads that have restricted the growth of the old historic cities and is replacing traditional urban cores with ill-defined urban spaces with little public open space but much space for vehicular movement. 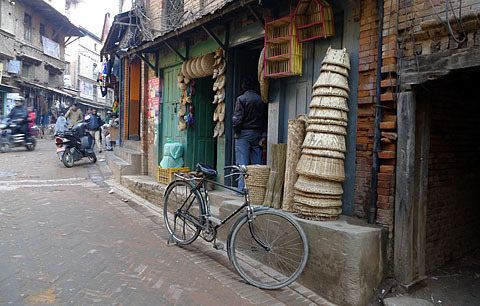 Kawan mentions that the Bhaktapur reconstruction program, aimed primarily at tourism development and improved economic opportunities, led to the adoption of the ring-road concept, which choked off further expansion of Bhaktapur (and other cities) and led to vehicle-dependent neighborhoods overshadowing the former pedestrian cities. 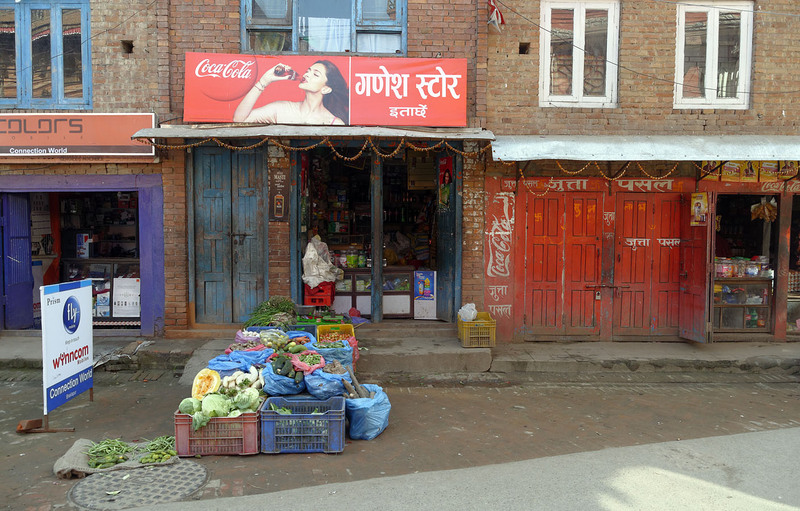 According to Kawan, it can be expected that, in an economics-dominated approach to contemporary town development, sociocultural functions tend to become a peripheral concern. It is likely that urban society will become fragmented and contentious. 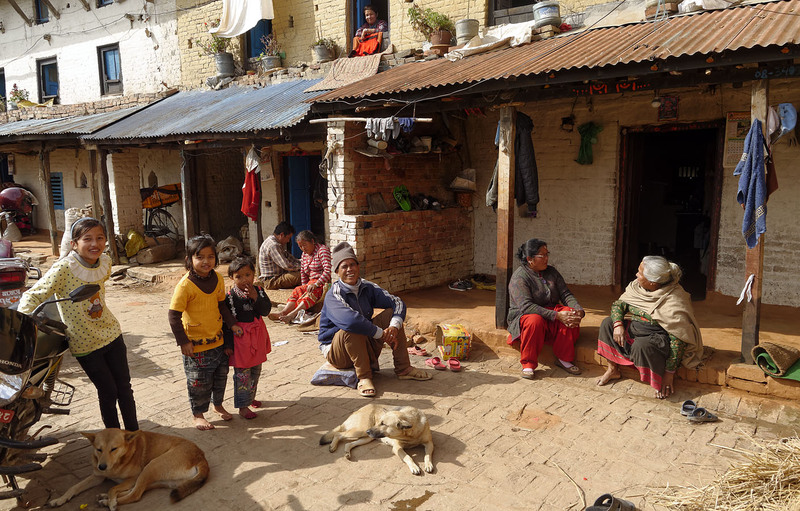 The urban poor will live in degraded social environments and most likely fail to achieve the prosperity that many other groups will enjoy. 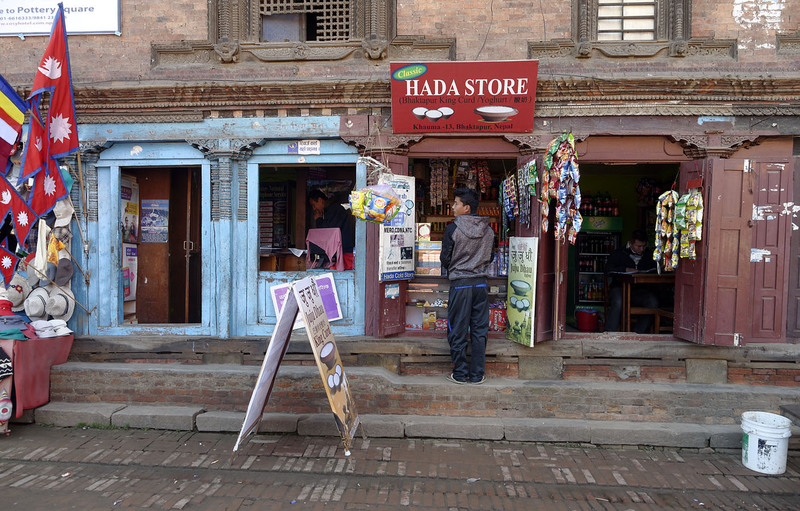 In the midst of the urge to catch up with the developing world, holding on to the standard notion of "development" and its strong focus on economic growth, Nepal may lose sight of its thousands of years of culture and heritage in the scramble for economic growth. Nepal needs to assess as a nation the value of its cultural heritage as a model for genuine societal progress, and this may come into conflict with Western values of "development." A city is represented not only by its infrastructure but also by how people react in the space and what the quality of life is. As in the modern Western world, Nepal is influenced by development trends. 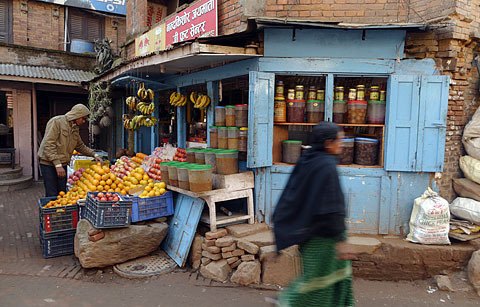 According to UN-Habitat, Nepal is the fastest urbanizing country in South Asia. The major cities are adopting vehicle-centric design, creating an unhealthy environment for the citizens. A human-centric design is concerned not only for the rights of the pedestrian but also for the people to socialize and mobilize. 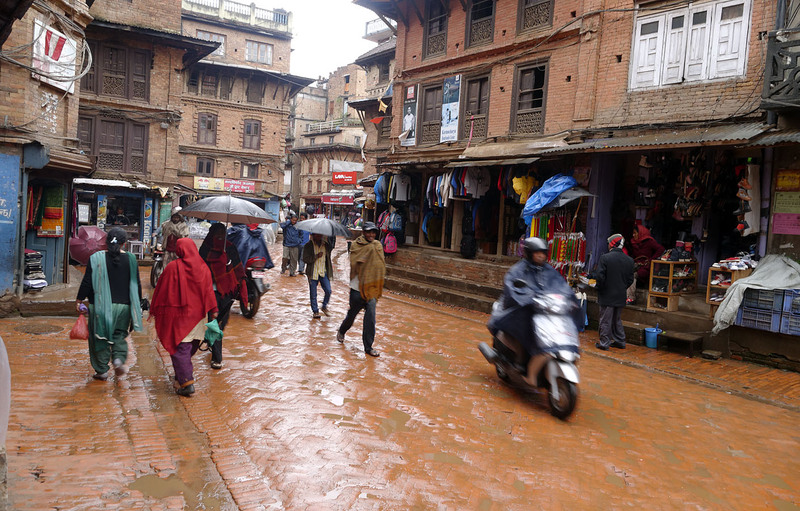 By contrast, in traditional Newari settlements the streets were always human-scaled. 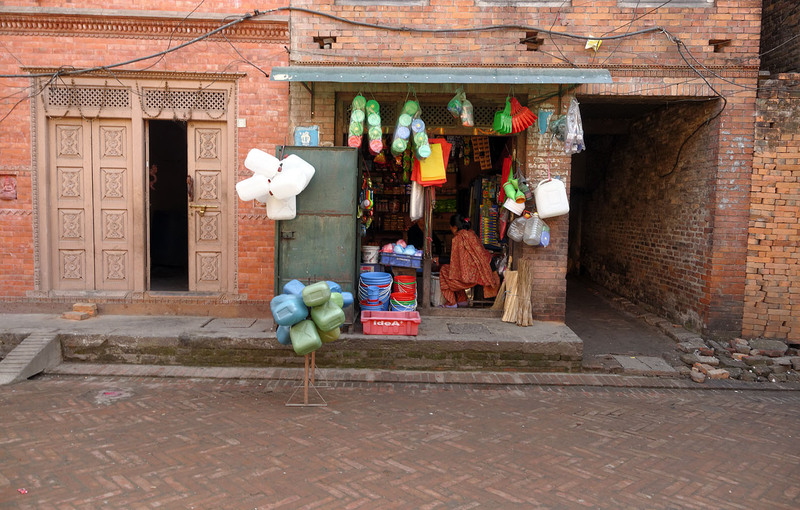 Narrow streets were paved with bricks and stones. 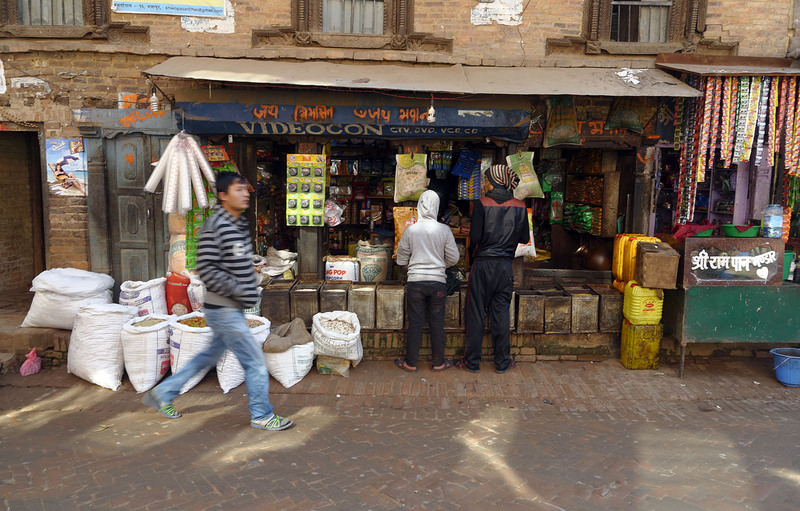 The presence of public spaces shows that the towns and their inhabitants valued community and social activities. They enjoyed a healthy and probably happy way of life. 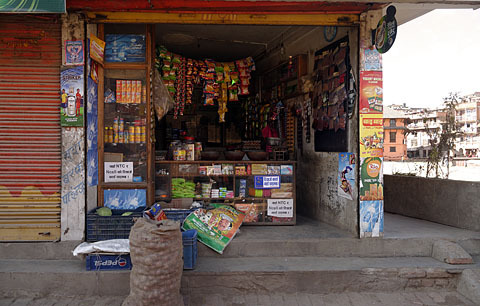 Newaris thought about community-level prosperity and sharing rather than about individual prosperity. Today, as modern amenities arrive, people are losing their bond with nature and the community in which they live in. Bhaktapur Municipality has restricted vehicles in its historical core, but due to lack of support from the locals and weak enforcement, this provision is scarcely observed. 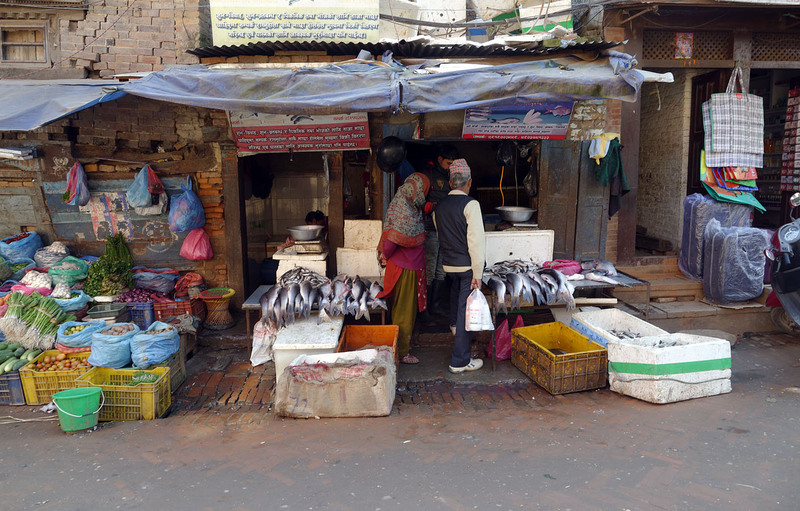 A huge gap has arisen between the local residents and government regarding conservation and development policies. 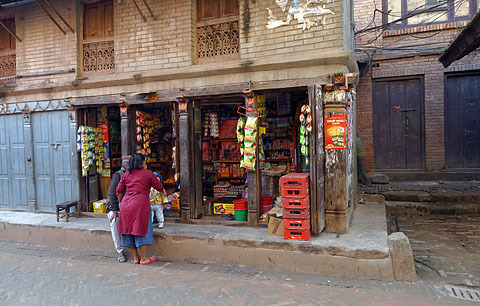 Residents were once highly involved in organizing the city structure, and development was mostly slow and organic, which provided time to reflect on the changes and development patterns. However, today's aggressive development does not provide time for reflection on what is wanted or how proposed changes would affect life. 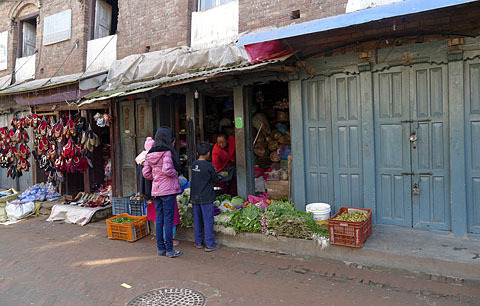 Once, people adapted spaces to fit their social and cultural needs. Today, city planning is centralized, and the role of the local residents in the process has declined, thereby forcing the people to adapt their way of life to centrally-planned spaces. The ancient Newari cities can serve as a template for sustainable cities and towns of the future, both in Nepal and throughout the world. They are among the most sustainable existing cities because they consume a minimum of land and resources. Many new city plans have proposed and some even implemented, such as Masdar City, which might be sustainable once constructed but which consume such extreme amounts of steel and concrete in their construction that they can never be replicated on a global scale. However, with comparatively minor adjustments, the Newari city model can be extended to practically any urban region in the world. 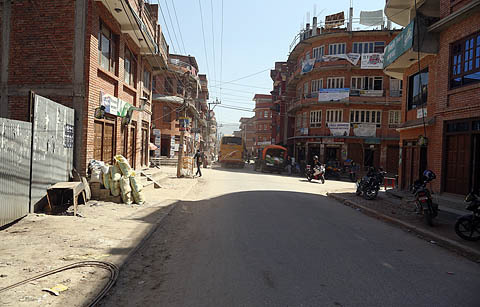 The biggest change needed is the addition of public transport systems in settlements that are too large to walk across. Traditional Newari cities are entirely compatible with the Design for Carfree Cities, as shown above. 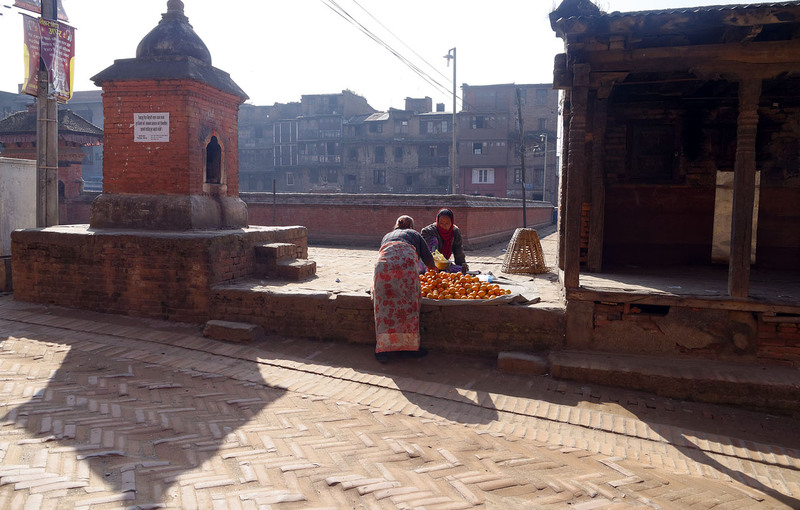 When planning any new city, we must study the way in which the neighborhoods of Bhaktapur were based on the role of individuals in relation to the whole community. Even today, the Newar social institutions are the binding force that maintain social harmony. 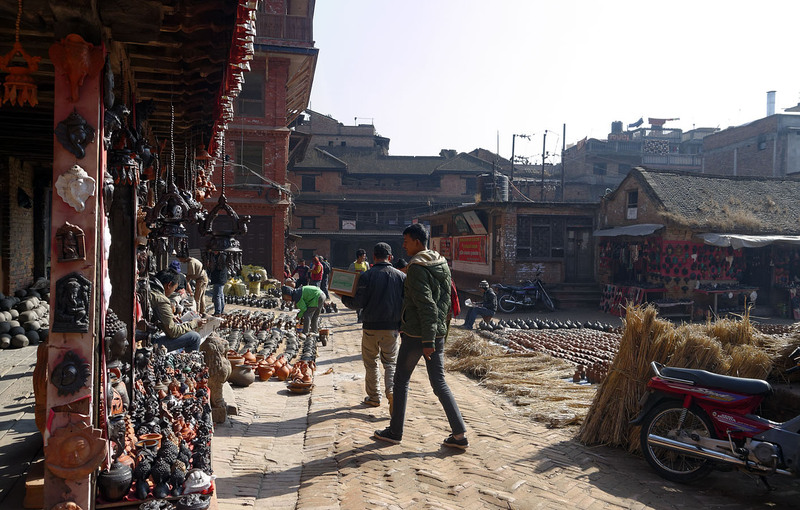 Today, life in the Newari cities differs from traditional life, with individual desires taking higher priority over the needs of the community. At a time when individualism holds sway, it would be a challenge to convince people to build a city that is based more on community than on individualism. Yet it is becoming apparent in the West that people are unfulfilled by the extreme individualism of their societies. They are beginning to view the suburban way of life, with its exquisite isolation, less favorably than community life in cities. This may signal an important change of attitudes in the West, which might slow the headlong rush of the rest of the world towards the Western model. It would help to preserve traditional cultures and values. The conservation of the tangible and intangible heritage of historical cities, such as those of the Newars, should be led by local families or communities rather than donor-based organizations. 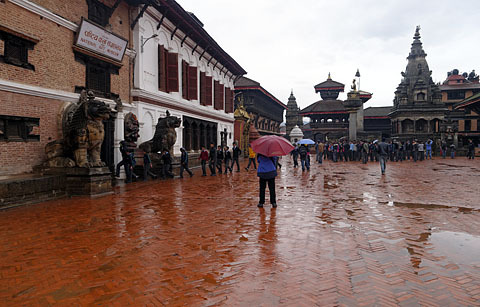 Indeed, such a shift was seen during the 40-year redevelopment process in Bhaktapur, much of it financed by generous foreign donors. As this evolved, local people demanded, and got, more say in the nature of the process, its objectives, and the final result. 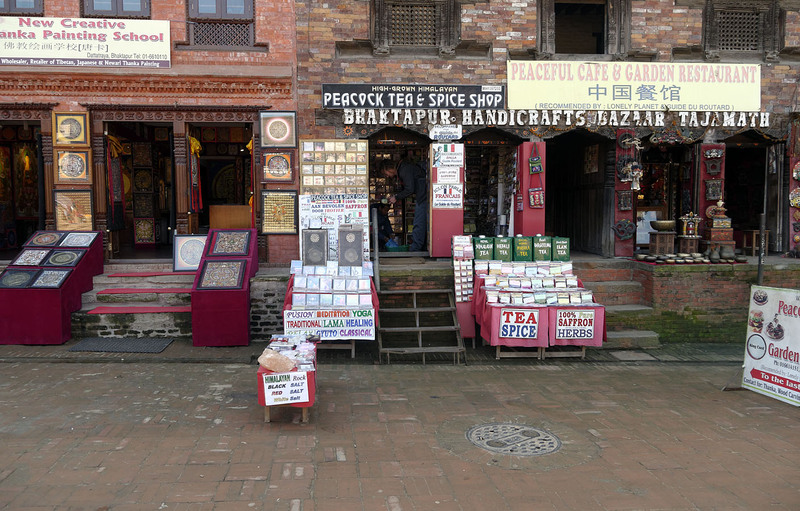 The younger generation in developing countries like Nepal is greatly influenced by Western trends, and if we are to preserve culture and tradition a significant effort must be made not to prevent them from falling beneath the wheel of Western "progress." Programs and workshops should be held to foster deep understanding of the culture as it has been received and to preserve cultural practices, traditions, and skills. 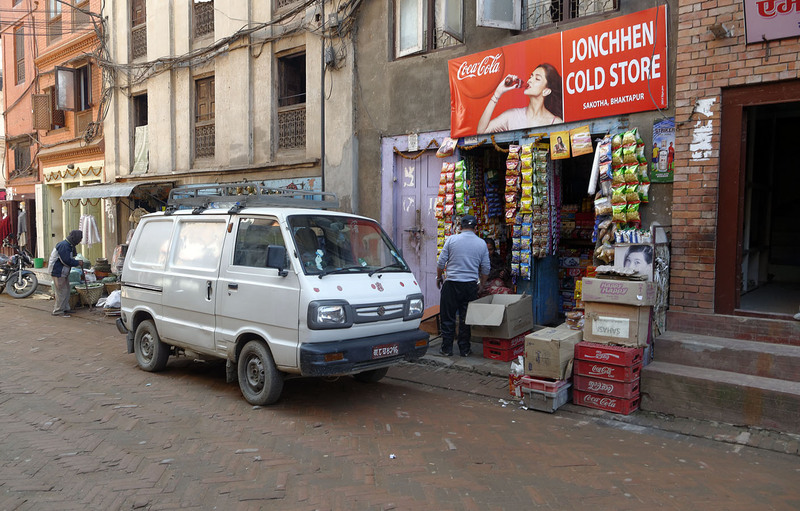 As the demand for private vehicles in historic cities increases, the issue can be managed by establishing parking lots along the edge of the town so that the greatest walking distance from the parking lots into town does not exceed 10-15 minutes. Internally, these towns have always been walkable, and if that advantage is to be preserved, the onslaught of cars and especially motorcycles must be curtailed. Public transport will serve the edge of the town, making the whole of the district readily accessible without the use of private vehicles. Predetermine the density of each settlement area in accordance with land use plans, and require their development at human scale. Give priority to the need for effective public spaces and the various uses to which they may be put. Give precedence to sociocultural issues over economic growth. Give the highest consideration to the establishment of a locally-based economy and of open markets on streets and squares that are arranged for the convenience of people, not machines. Abandon simplistic, grid-based town plans and establish in their place streets that are unique in their characteristics and well adapted to the opportunities and challenges of the site. Preserve existing traditional social spaces. 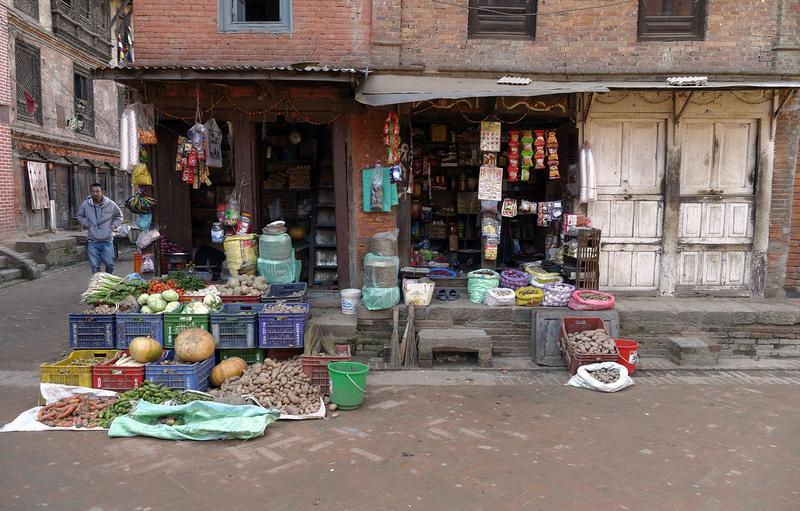 If applied in Nepal, these guidelines would help to preserve the inherently sustainable qualities of Newar settlements as well as to protect the Newari culture. As with traditional city forms generally, this should serve to create new urban areas that are highly functional and attractive for both their residents and for those visiting from elsewhere. Dristy Shrestha lives in Kathmandu and is active in the carfree and bicycling movements. She is in charge of developing the theory and practice of carfree villages here at Carfree.com. We would like to acknowledge the assistance of Shyam Sunder Kawan for his assistance in preparing this article. Sources consulted in the preparation of this article are given in links within the article text. Thanks to Debra Efroymson, Piper Hollier, Richard Risemberg, and Doug Salzmann for suggesting articles. Thanks to Bansidhar Sainju for production assistance. "Prince Charles reveals 10 principles for 'more mature view' of urban design"
Harmony - the playing together of all parts. The look of each building should be in tune with its neighbours, which does not mean creating uniformity. Richness comes from diversity, as Nature demonstrates, but there must be coherence, which is often achieved by attention to details like the style of door cases, balconies, cornices, and railings. Materials also matter. In the UK, as elsewhere, we have become dependent upon bland, standardised building materials. There is much too much concrete, plastic cladding, aluminium, glass and steel employed, which lends a place no distinctive character. 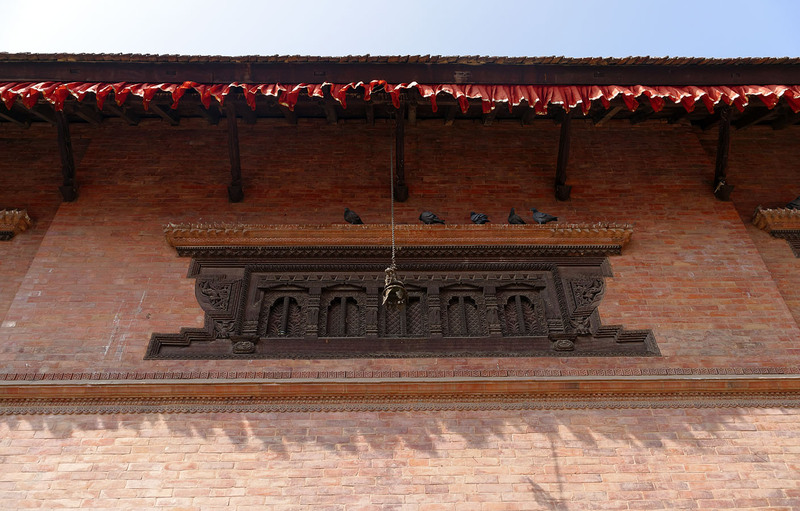 For buildings to look as if they belong, we need to draw on local building materials and regional traditional styles. Signs, lights, and utilities. They can be easily overused. We should also bury as many wires as possible and limit signage. A lesson learned from Poundbury is that it is possible to rid the street of nearly all road signs by using ‘events’ like a bend, square or tree every 60-80 metres, which cause drivers to slow down naturally. "Survivable IPCC projections are based on science fiction - the reality is much worse"
"Fusion reactor concept could be cheaper than coal"
See also: "Lockheed Martin Says It Will Have A Working Fusion Reactor In 10 Years - But Will It Matter?" and "Cold fusion reactor verified by third-party researchers, seems to have 1 million times the energy density of gasoline"
"Expert: U.S. Has Leveraged Economy On Shale Oil, Which Saudis May Be About To Crash"
"Is the US Overplaying Its Energy Hand?" "Anti-'Geoengineering' National Academy Report Opposes 'Climate-Altering Deployment'"
"Density is Great, But Walkability Needs More"
"An Example of Low-Rise Intensification: Union Street EcoHeritage"
"Fine Grained - Strong Towns"
"Bike racks in car bays lift shop trade"
"Paris mayor announces plans for a car-free city centre, plus €100 million for bike lanes"
"Geef de fiets de ruimte waar hij recht op heeft"
"A Brief History of Happiness: How America Lost Track of the Good Life - and Where to Find It Now"
"The Real Reason U.S. Gas Is So Cheap Is Americans Don't Pay the True Cost of Driving"
"U.S. DOT highway travel demand estimates continue to overshoot reality"
"Forget the Damned Motor Car"
"Let's eliminate the biggest problem on Chicago's streets: Cars"
"A Major Surge in Atmospheric Warming Is Probably Coming in the Next Five Years"
"Methane releases from Arctic shelf may be much larger and faster than anticipated"
"2014 Was The Hottest Year On Record Globally By Far"
"NASA, NOAA find 2014 warmest year in modern record"
"What We Learned About Climate Change In 2014, In 6 Scary Charts"
"Goal to end fossil fuels by 2050 surfaces in Lima UN climate documents"
"Warmer Pacific Ocean could release millions of tons of seafloor methane"
"Satellite Map Shows Evidence of a Dangerous Arctic Warming Feedback Loop"
"Research casts alarming light on decline of West Antarctic glaciers"
"China confirms its southern glaciers are disappearing"
"Leave fossil fuels buried to prevent climate change, study urges"
"More Research Links Australia's Extreme Heat To Climate Change"
"A 'megadrought' will grip U.S. in the coming decades, NASA researchers say"
"Far From Rising Seas, Climate Change Plagues Kathmandu: Cities"
"Rate of environmental degradation puts life on Earth at risk, say scientists"
"Renewable resources reach their limits"
"Inside Beijing's airpocalypse - a city made 'almost uninhabitable' by pollution"
"How a Chinese City Might Transition to a Low Carbon Future"
"Dear media: Stop using the phrase 'clean coal' "
"Say Goodbye to the First Near-Zero Emissions Coal-Fueled Power Plant""
"Coal Companies Are Selling Coal To Themselves To Get More Government Subsidies"
"Delaware-size gas plume over West illustrates the cost of leaking methane"
"United Nations Calls for an End to Industrialized Farming"
"Agricultural insecticides pose a global risk to surface water bodies, researchers find"
"Who Should Clean Up Big Ag's Mess?" "US Addiction to Corn and Cars Is Fueling Global Hunger and Displacement"
"Scientists Propose High Seas Fishing Moratorium"
"Biodiversity: Life - a status report"
"Scientists Seeking to Save World Find Best Technology Is Trees"
"Bionic leaf: Researchers use bacteria to convert solar energy into liquid fuel"
"China To Create Carbon Market And Cap Emissions"
"What's the carbon footprint of ... a new car?" "BP says CO2 emissions unsustainable, warns on global warming"
The next issue of Carfree Times is scheduled for June 2015.